I guess that's why warm rolls fresh from the oven always remind me of the holidays. Plus, aren't leftover dinner rolls essential for sandwiching leftover turkey, stuffing, and cranberry sauce the next day? 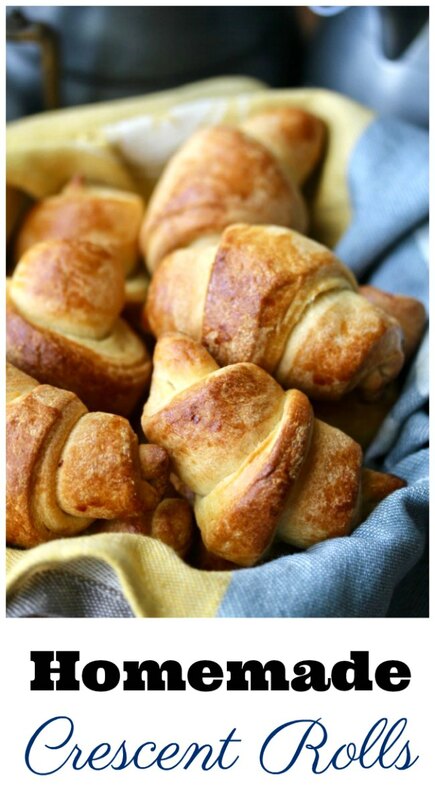 One of my favorite rolls were crescents, usually from Pillsbury. By the way, lest you think I'm a bread snob, I'm here to tell you that Pillsbury crescent rolls and Grands still have an occasional place in my kitchen. I love using the crescent dough for making pigs in a blanket. One of these days I will have to post our family favorite "Parmesan Pull-Aparts" made with Pillsbury grands. 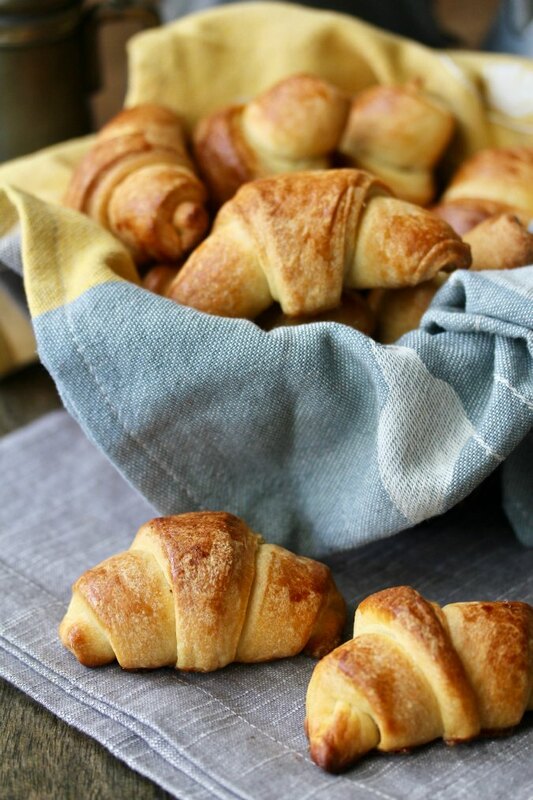 How are these homemade crescent rolls different from the canned rolls? Because I brushed these crescent rolls with an egg wash, the outside was a little more crispy. You can skip the egg wash if you prefer a softer crust with a lighter color. The interior of these rolls is still soft and fluffy, and of course buttery. These rolls are almost as convenient as the canned version. After you shape the rolls, cover them with plastic wrap and freeze them on a baking sheet. Once they are frozen, stick them in a freezer bag to make later. When ready to bake, just defrost the rolls and let them rise as usual at room temperature. This month our Progressive Eats theme is Old Fashioned Christmas/Holiday Recipes - recipes found on your childhood holiday table, a theme chosen by Liz of That Skinny Chick Can Bake. If you're unfamiliar with the concept, a progressive dinner involves going from house to house, enjoying a different course at each location. With Progressive Eats, it’s a virtual party. A theme is chosen each month, members share recipes suitable for a delicious meal or party, and you can hop from blog to blog to check them out. Come along and see all of the delicious nostalgic holiday dishes! Whisk 2 cups of the flour together with the sugar, yeast, and salt together in the bowl of a stand mixer. In a medium bowl or 4 cup measuring cup, whisk together the milk, melted butter, and the egg. With the mixer on low speed, using the dough hook, slowly add the wet ingredients to the flour mixture. Mix until all of the flour has been absorbed. Add more flour, 1/2 cup at a time, until you achieve a tacky, but not sticky dough. Knead for three minutes more at medium speed. Cover the bowl with plastic wrap and let rise for about 45 minutes, until doubled. Gently deflate the dough and divide it in half. Form each dough piece into a ball, and roll each out into a 12 inch disk. Using a pizza wheel or bench knife, cut the dough rounds into 12 wedges each. Starting with the outer edge, roll each wedge up and place them, point down, onto a parchment lined baking sheet, about 2 inches apart. Cover with oiled plastic wrap, and let rise for 45 minutes, until doubled. Heat the oven to 400 degrees F.
(Optional) Whisk together the egg wash ingredients. 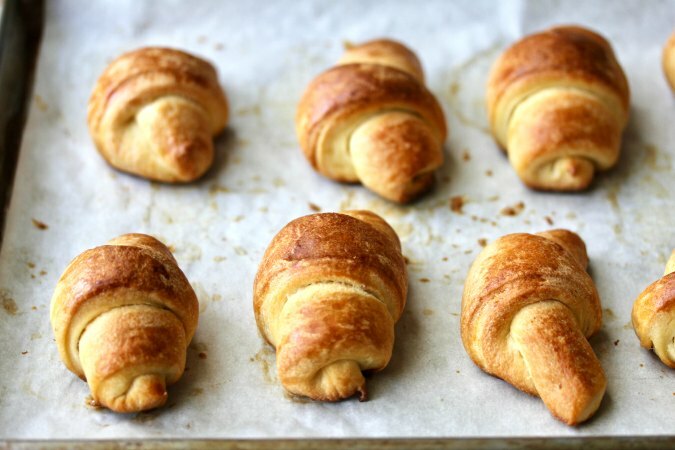 When the crescents have risen, brush with the egg wash.
Bake the crescent rolls for 12 to 14 minutes, until browned. Serve warm. These look amazing! Perfect for a special holiday meal!! What a treat! 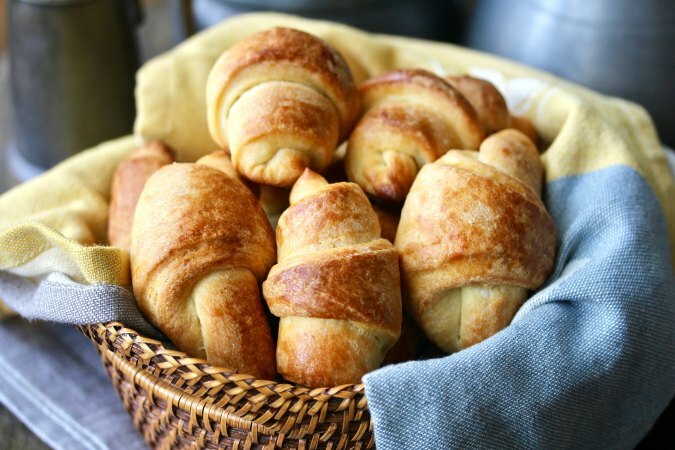 These homemade crescent rolls are beautiful and no doubt absolutely delicious! I love melt-in-your-mouth crescent rolls!! I made some cheese and onion biscuits last night to go with dinner, and now I want to make these! Ooooh, cheese and onion biscuits sound delicious. I feel inadequate. Never had one. I've seen the Pillsbury boxes in the grocery store, I am sure they would be great to speed up pigs in a blanket... nothing wrong with that! well, that is probably the case! Karen, These are lovely and so perfect! I love that you can make these ahead of time, freeze and thaw when needed. Definitely as convenient as the canned kind!